Mini spy cameras are small and portable devices that provide covert surveillance. Most are battery powered and some are AC powered, giving you the flexibility to record high quality video wherever you need it. Should I get a battery powered or AC powered camera? Most of our mini spy cameras are designed to be portable, so you can take them and use them wherever you need. Because they are battery-powered, they obviously need to be charged after a while. Battery-powered mini spy cameras can last from a few hours to even up to 10 days, depending on the type of battery inside, before needing to be recharged. What Recording Mode is Better - Motion Activated or Continuous Recording? Motion-activated mini spy cameras begin recording whenever motion is detected, like a person walking into the room, or past the camera lens. This is great for conserving battery life. Sometimes you want continuous recording however, which records continually, no matter if there is motion or not. Can These Cameras Record in the Dark? Cameras are usually designed to record in normal lighting conditions, but we also have mini spy cameras that record in the dark using IR Night Vision technology, like the Motion Activated Night Vision Mini Spy Camera. Where are the Video Files Saved? Video (and images, for those that take still photos) are either saved on internal flash memory, or onto a removable SD Card or micro SD card. If the videos/images are stored on internal flash memory, you'll need to connect the camera to your computer with the included USB connection cable to view the videos. For the cameras with removable memory card, you can also connect it directly to your computer, or remove the memory card, and insert that directly into your computer, or into an SD Card Reader. So You've Got a Mac Computer, but Want a Spy Camera? Many of our cameras only work with PC-based computers, but Mac users need not worry! For Macintosh owners, we recommend purchasing any of our mini spy cameras with removable memory card. Since memory cards are not computer platform specific, you can view these files easily on a Mac! For both PC users and Mac users, we recommend downloading VLC Media Player, which is a free program that plays almost every video type in the world. Please give our product experts a call, or contact us here. We look forward to hearing from you! We know many people may not live and breathe hidden cameras and mini spy cameras like we do. And that's okay! Our product experts have put together a list of commonly used terms you may run across while browsing our camera equipment. And of course if you come across a term you aren't familiar with that isn't listed here, feel free to reach out to our sales and support team and we'll be glad to answer any questions you have! One term you might run across quite frequently is a micro SD memory card, which is an optional accessory available with many of our hidden cameras. A memory card is needed if you wish to record video from your mini spy camera. For a self-recording or all-in-one camera, a memory card is needed in order for the camera to operate. With WiFi cameras however, a memory card isn't needed for streaming, only if you wish to record your video. Memory cards vary in size, common sizes are between 8GB and 128GB. The more gigabytes (GB), the more video files the card can hold at a time. Old videos can be deleted off the card if they are no longer needed. To view files on the memory card, you need to insert the card into your PC or Mac comptuer's card reader slot, or an SD card reader (see below for more info about card readers). As mentioned above, to view the video files on your memory card, you'll need to either have a built in card reader slot on your computer, or use an SD card reader. An SD card reader is a small device that you insert your micro SD card into, and then plugs into your computer's USB port. Since virtually all modern computers have USB ports, this allows you to view your video files on almost any PC or Mac computer. While most mini spy cams use a micro SD card to store videos, some cameras feature internal memory. This is a type of "built in" memory that is not removable from the camera. To view the videos on a device that stores videos to internal memory, you'll connect the camera directly to the computer, usually via USB. 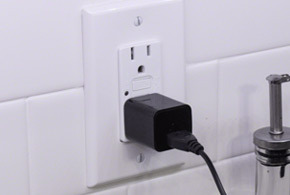 An example of a camera with internal memory is the power cord hidden camera. Night vision hidden cameras are unique in that they have special IR (infrared) sensors, that allow the camera to see in low light and no-light situations. This is ideal if you want to be able to see what's going on around the clock, even when the lights are out. Almost all of our night vision mini spy cameras feature "invisible" IR sensors, meaning that they do not emit any "red glow" that traditional security cameras with night vision have. This allows the camera to remain covert and not draw attention to it. One of two common recording modes, motion activated recording, or "motion detection", is a popular and preferred mode for recording video. In motion detection mode, your camera will only record when it detects motion or activity. So for example, if a person walks in front of the camera, the camera will then start recording, and continue recording for a pre-set amount of time, or until motion stops. This is convenient because it cuts down on wasted recordings, so you can spend less time going through dozens or even hundreds of video files, and get right to the action. One common misconception about motion activated recording is that it will conserve battery life. This is not true in most cases, because even though the camera is not recording while it waits for motion, the camera is still on and looking for motion, which uses battery power as well. There is one type of motion recording that does actually conserve battery life, which is called "PIR" or "passive infrared recording", which is a more advanced form of motion detection, and is explained below. A more advanced form of motion detection recording, PIR recording is a recording mode that uses a "body heat" sensor to detect motion. What this sensor does is look for a change in temperature in the camera's field of view, rather than actual movement. This type of motion detection is the best type because not only does it save on memory card space, but it also conserves battery life, as the camera is technically "off" while the PIR sensor is detecting a heat signature change. Many of our PIR cameras can get over 90 days or even over a full year in standby mode waiting to detect activity. A camera's video resolution represents the quality of the recorded or streaming video. Not too long ago cameras recorded in a maximum of 640x480 or 720x480 video. Now almost all cameras offer HD recording - some are 720P and some 1080P high definition. We've even came out with a few 4K hidden cameras that offer an even higher quality video recording.